I get some interesting requests sometimes. With this Taonga, I was asked to integrate the ashes of someones dearly departed partner who has been cremated, into a bone carving. And yes, as according to protocol, appropriate rituals were conducted to enable me to mount the ashes in this way. They are contained in the central inner circle of the carving. I have also integrated various meanings that reflect the life of this person. As such, this Taonga is very personal and contains a lot of significant symbolism relevant to the very kind person who has commissioned me to do this. This very special Taonga is named Aroha o Matapopore. Like all my work, this Taonga contains various meanings at different levels. Matapopore means to watch over, careful of, cherish. It also means highly prized, highly valued, cherished, much loved, treasured, concern, attentiveness, guardianship, and care. So together with Aroha, it means to watch over with love. This is an appropriate name for a Taonga such as this. The inner circle in the centre of the Taonga holds the ashes of your dearly departed one, Mahlon. These have been purified and blessed and are therefore suitable to be adorned within this Taonga. At one level they symbolise the life essence of Mahlon, they also symbolise great reciprocal love. Love is the great protector. Hence being inside the protection circle. The two koru in the middle are enveloping the circle, or heart of the Taonga. They are being ‘held’ by these two Koro. They also have several layers of meaning. They represent great protection and being surrounded by your love and warmth. 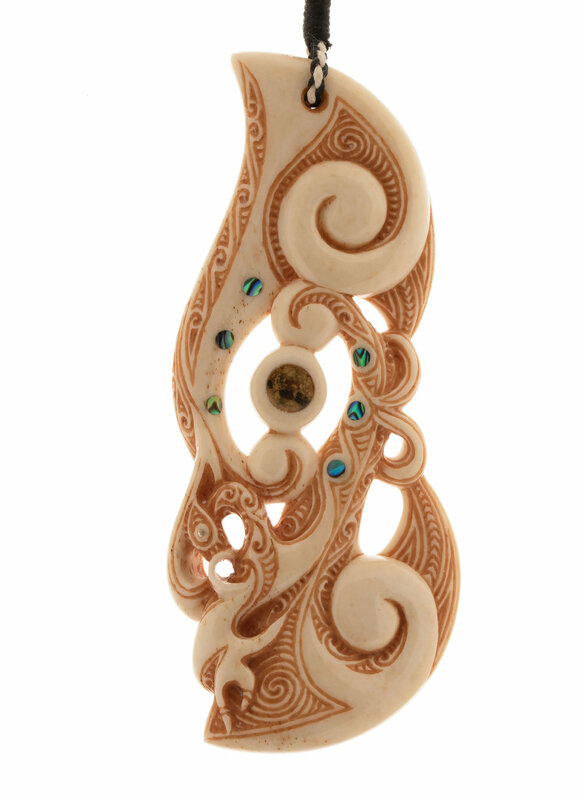 Being Koru, they symbolise the unfolding of new life. The right-hand side of the koru is being griped and supported by the continuation of his lineage or bloodlines, the great love of his children and mokopuna. Also, at the deepest level, this represents full enlightenment of Mahlon’s mental continuum. Ultimate union. There is a Spiritual Guardian in the aspect of a Manaia which also represents the connection with mutton bird gathering. This Manaia has Stirling silver inlays for the eyes. This represents the ability to see what is precious in life. The Manaia sits upon a spiral pattern. It symbolises going deep within our heart and mind to awaken our full potentials. A Manaia is a spiritual guardian and a symbol of good luck and spiritual protection. It forms the profile of a Tiki. This is symbolic of being half in this world and half in the spirit world. The Manaia can be adapted with other symbols and stylized to communicate different aspects, or meanings. The large Koru at the top and bottom represent the saying as above, so below. They are symbolic of the unfolding of great wisdom within our heart. Through receiving blessings, we generate a pure mind. A pure mind give rise to a pure world. Running up the left side of the Taonga is a flow of waves and ocean currents This is also reflected on the back side of the carving. As such, This Taonga has a strong connection to the sea. At another level is symbolises being able to navigate the currents of life successfully and to safely reach our ultimate destination. There are six small inlays of Pāua on the front. These are the five senses and mental consciousness. They symbolise spiritual transformation and crossing the divide. By purifying our mind of all negativity, we can then realise our own true nature. On the back of this taonga is two inlays. The top is a Pāua. If you look closely it looks like it has a pupil. This symbolises wisdom. The bottom is an inlay of Mother of Pearl. This symbolises great compassion. We need both wisdom and compassion to attain ultimate happiness. The three notches within the engraving represent receiving blessings upon our body, speech and mind. They flow through our central channel giving rise to great bliss. The carving has been registered in my database of work. I sincerely hope you enjoy the carving and over time come to fully understand all the various layers of meaning imbued in this creation. I wish you and your whānau the deepest peace and happiness.